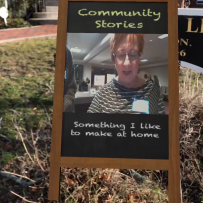 We’re excited to announce a new prototype we’ve developed: an Augmented Reality application where visitors’ stories become embedded throughout a community. People often ask: “What can you do with stories after you’ve recorded them in exhibits?” We’ve been happy to provide a number of ways that extend the reach of exhibits: 1) share them on the museum’s social media feed, 2) incorporate them in a curated playlist in exhibits, 3) create a signature exhibit destination such as a StoryFall. The Augmented Reality prototype adds another possibility for museums to extend their reach. We’re excited to move this forward, and think it presents a new model for using stories to connect exhibits to community. If you’d like more info, feel free to drop us a line.